Porthmadog is a small town, retaining much of its past character and fascination with many visible reminders of its past and a strong tradition of using the Welsh Language. Much of its development was due to Alexander Maddochs who was struck by the beauty of North West Snowdonia and felt that the area would become the last staging post for travellers to Ireland. Thus in the late eighteenth century he laid the foundations for what today is Porthmadog and Tremadog. Porthmadog developed in the early 1800's with the demand for slate around the world and the subsequent building of the narrow gauge railway (the present famous Ffestiniog Railway) in 1836 to the harbour built in 1825. This led to the birth of a new maritme community as captured today in the Maritime museum. 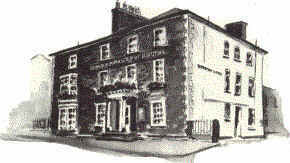 As Porthmadog became the crossroads for travellers in the region, so the Royal Sportsman was built and visitors would be transported in its famous carriage and horses to their final destinations locally.Built originally as a coaching inn in 1862, the Royal Sportsman has retained its traditional charm, atmosphere and the very warmth of Welsh hospitality and service even though it has been extended and modernised. It commands a central position in Porthmadog, sited at the western end of the high street, fronting the main A487 road and, in the region, it is considered to be the ideal base to tour the whole of North Wales. It offers a total of 28 single, double, family and twin en-suite rooms with colour TV, tea and coffee making and direct dial facilities: 19 rooms are in the main building whilst 9 are in the adjoining ground floor Orchard garden annexe which are particularly suitable for the less active, families with babies or small children and dogs.